Of Dutch and New Zealand heritage (born 1960), I grew up on a dairy farm in Taranaki, Aotearoa / New Zealand. I left school to work in an abattoir (The Patea Freezing Works). I had to overcome the prejudices of my working class background and an unhappy childhood before I was brave enough to try art school. I was lucky. 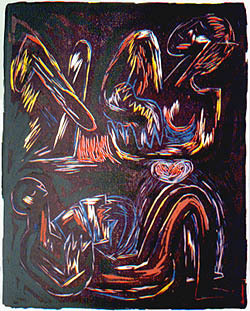 I am sure that this background was the main reason why I could never accept Abstract Expressionism as a way of working. My work has always been consciously informed by issues in the world around. 50 x 70 cm. Edition of 17. These lines are from the poem New Vessels, (1987) written by Sen McGlinn. Fire & Rain was one of a series of about 20 images that illustrated this epic poem. acrylic on paper, 45 x 70 cm. 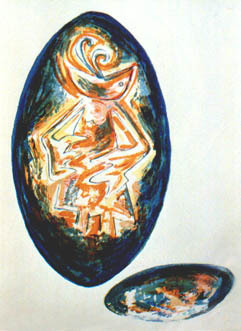 These Maatua were an adaption of the New Zealand Maaori poupou (ancestor) figures often carved vertically one under the other and recording the heritage of a people or sub-tribe. 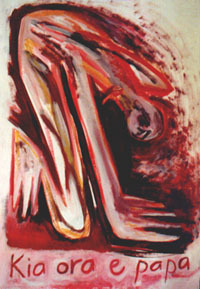 I used an isolated figure, in an ambiguous confined space where the tongue became a hand that both reaches and creates a (womb-like) space in front of the body. Most people saw these as exotic monsters not to be taken seriously. I got sick of them being called monsters, and so I stopped making them and began using text more directly in my work. Greetings Mother!, was another image was in this series. And the painting illustrated here was a reworking of my homesickness for things Maaori. Here in the Netherlands people walk on the land controlling it and containing it. In Aotearoa (New Zealand) we personify the land. Papatuanuki is our mother. From New Vessels, the book. My first works in the Netherlands were responses to the psychologicaland spiritual coldness I felt here. My He Matua (Parent) images screamed became angrier and angrier. Screaming for contact daring you to look at them in the eye. I was surprised at how angry they were and how hard I found it to live here. They were also direct responses to the feeling that I had to paint like a man to be taken seriously by my tutors. I was even instructed by the painting tutors to paint with a large paintbrush and to paint objectively! 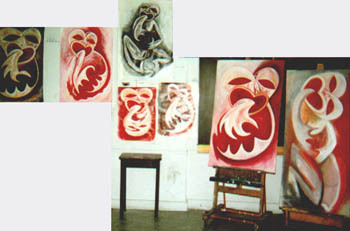 artschool studio view, 1989. Acrylic on canvas or paper. From 200 x 50 cm until 70 x 50 cm. I used words to challenge the idea of objectivity, and to tell my story. And the sky returned to its proper place, is a lithograph of a screaming woman. I was angry at the blatant sexism of the painting department (and each year the women 'dropped' out until only two of us were left in the final year), and I deliberately used the chicken / egg symbols to give the story a twist as well as using imagery, colours and forms, that had been termed as 'subjective' by my tutors. I was fighting the idea of the 'universal' as preached by my tutors. It was hard because no one around me seemed to see what I was doing. My work was called feminist as if that was an insult, and dismissed. Reading feminist literature kept me sane. see A Wild animal feeds her young. The snake forms the boundary -the world- or history. But the fluid lines seem as if they could move at any moment. The women are and seem contained while one steps on the boundary. More prints on similiar themes. Lithograph and silkscreen print on paper. 25 cm in diameter. Edition of 15. All art carries a message, as does history. 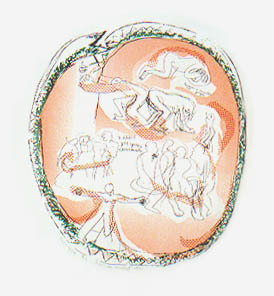 For example In the print, Carrying a Message (on the left), a figure enters the house-shaped space carrying the words, "Carrying a message" and it is intended to be read tongue-in-cheek. The use of thin graceful lines and soft colours give a sense of the poetic while the cartoon-like figuration, and the choice of subject matter, add a touch of humour. 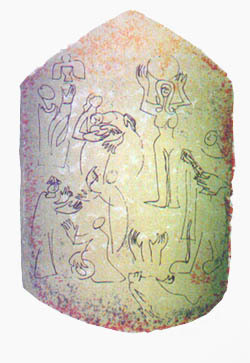 Various messages (with religious overtones) are suggested in the drawings of a woman holding up a circle, the priest holding up the host, a lying (dying) figure, the kneeling figure, or in the two gesturing figures. That was what I thought of the tutors' attitudes about making 'independent' art. I even gave it "legs" so that it could stand on its own 'feet'. 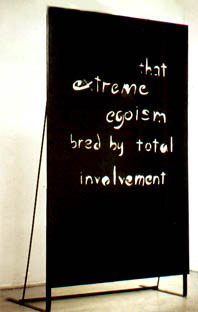 For my graduation exhibition I dispensed with the object and projected a slide of the text above a doorway. I realised during this struggle to be taken seriously that dialogue in the art world (whatever that really means) was important to me. And I realise now that much of my anguish was due to isolation and a lack of dialogue. I am now not so worried about showing my more figure work along side my more text-based work. There is no need to prove my professional status by a display of consistency. "...consistency is the fetish of small minds."